Vaudeville was a theatrical genre of variety entertainment in the United States and Canada from the early 1880s until the early 1930s. Each performance was made up of a series of separate, unrelated acts grouped together on a common bill. Types of acts included popular and classical musicians, dancers, comedians, trained animals, magicians, female and male impersonators, acrobats, illustrated songs, jugglers, one-act plays or scenes from plays, athletes, lecturing celebrities, minstrels, and movies. That is exactly what you can expect when you visit Vaudeville in Mechau Street, just off Buitengracht. I’m sure that Vaudeville will not be happy about me drawing comparisons between it and the Madame Zingara Tent of Dreams, but I have to. They are basically the same concept, so the Tent of Dreams is the most appropriate point of reference. If you went to the Tent of Dreams, then you will know what to expect. A three course meal and a variety show to entertain you from beginning to end. I would say that Vaudeville is about 85% what the Tent of Dreams was, which means that it’s definitely worth a visit. I’ve been twice, once under invitation and again with a group of friends and the experience was fairly consistent. The show is definitely more of an attraction than the food. The starters are awesome, sourdough bread accompanied by a bunch of patés (hummus, butternut, smoked aubergine, chicken liver) and a fantastic salad (roasted butternut, Danish feta & beetroot). On both occasions I made the mistake of filling up on the starters because they are so damn tasty. The mains change every few weeks but offer a choice between a seafood, meat and vegetarian option. The seafood pasta was pretty good, but the meat options which is what I had on both occasions were average. The dessert was different each time but delicious. The show is impressive. Some dancing, singing, acrobatics and much more. Some of the acts are really quite spectacular. The show is well put together with excellent music and talented performers. What I really like about Vaudeville is that it gives these performers, who have obviously spent their lives in dedication to perfecting their skills, a chance to share what they have achieved and receive some recognition. It’s not an inexpensive evening, at R350 for dinner and show (or R395 for ringside seats) plus drinks. But it really is worth it. Get a group together and make a night of it, even dress up if you like! For those in the mood to party afterwards, the resurrected Fez club shares the venue and if you’re lucky, you’ll spot some of the performers sharing a post show drink and you can ask them for tips. So for someone who hasnt been to either which is better Vaudeville or Madame Zingara? 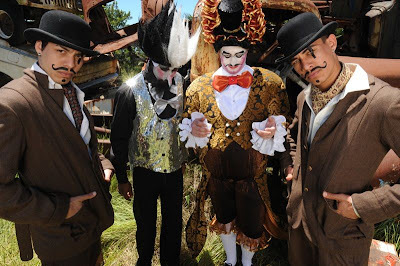 I think Madame Zingara is a better experience, but not by much.